For this week’s Mini-make tutorial we’re keeping things super simple! 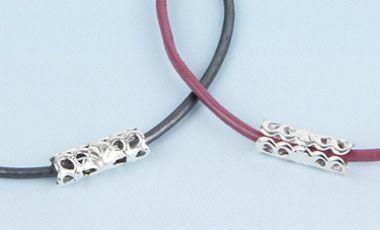 As Spring and summer approaches you’ll see a lot more of these single strand bracelets on the high street with either a cute connector or charm in the middle. In keeping with the Spring theme, I’ve handpicked a beautiful new filigree tube as the main feature for these leather bracelets! Cut a length of leather approx 6 inches and cut the ends at a sharp angle to make a point. Put the filigree tube onto the leather. Glue each end of the leather into the cord ends and allow to dry. Attach the cord ends to the clasp with a jumpring on either end.